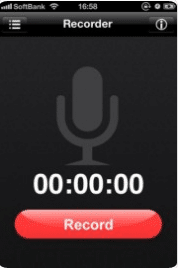 Sky Recorder allows you to record Skype conversation on both your iPhone/iPad. All that you have to do is to tap on the Record button and you are good to go. You can even set it up on speaker. The tool is good for those people who find themselves in daily business talks. The best thing about this application is the fact that you can be able to restart recording again in the case your recording has been put on hold because of an incoming phone call. It also supports recording through the device system such as the speaker phone although this requires you to initiate the call at once and then switch over to sky recorder. When it comes to recording conversations or other sensitive material, sky recorder will require permission of the other person in order for this to take place. This helps to increase security between both partners. Sky recorder can act as a virtual notepad. Meaning that if you have ended a Skype call and you are probably trying to remember what was being spoken about, or you are struggling to remember the exact dates and names, sky recorder will help you solve all those worries. This application does not work well on phone calls. It only operates on Viber and Skype. This application does not record normal phone call conversations. It is that kind of application that you have to tell the other end user that you are recording the conversation. Unfortunately, this application is not a universal app. It can only work on an iPad or iPhone OS compatibility. Many times when you are making that call on Skype, VoIP app or Viber, chances are that you not anywhere close to a notebook or a pen. In such situations, recording your conversation is the most fast and convenient way to keep track and records for all your conversations. On that note therefore, SkyRecorder is a must have and using it has no difficulties at all. Let me show you what to do in order to achieve a clear and a full length talk record. You have now downloaded the tool and installed it successfully. Launch it and tap “Record” button. Next, go to Skype and place your call. It is more advisable that you set it to Speakerphone when using Skype. Immediately after that, go back to SkyRecorder tool and click “Record” button. Tap “Stop” when you are through with your call and save your recording. You can then go to your saved files and replay your audios. Alternatively, you can decide to edit and come up with a more professional recording. This is the best application for those people who find themselves in the middle of conversations or even interviews and are needed to take down notes but for one reason or the other one they are not able to do so. If you are on a Skype audio session, you can clearly be able to record conversations from both ends. This application will take down and save notes for future reference.If you are planning to acquire this software, arm yourself with only $1, 99, it’s not that bad either. 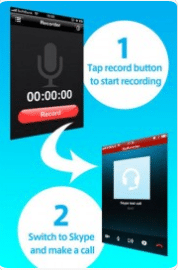 Trust Sky Call Recorder for all of your Skype conversation.